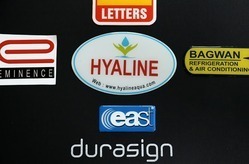 - Dome stickers are the right solution for your brand to stand out in style. - Also known as bubble stickers, formed by a clear layer of polyurethane give a high quality three dimensional (3D) appearance with remarkable visual impact. As part of your brand strategy, using domed labels as logo emblems for distinctive product branding and corporate advertising is a proven winner. Your corporate logo on any product will never look so good or last so long. Having a definite quality management system, we are readily engrossed in bringing forth a comprehensive gamut of Doming Stickers. Deal only these areas :- Pune, Ahmednagar, Nashik, Sangamner.